Shri. C. Kathiravan, IAS, Collector and District Magistrate, Erode is an officer of Indian Administrative Service belonging to batch of 2009. He attained his master degree in Agriculture (M.Sc. Agri.) and Human Resource Management MBA(HRM). He was selected as Deputy Collector by the TNPSC Group-1 Services. He served as Revenue Divisional Officer at Kallakurichi and Aranthangi. He discharged duty as District Revenue Officer at Villupuraram and Thiruvannamalai districts. He also served as General Manager, AAVIN, Salem. 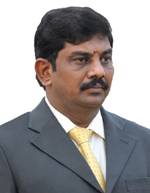 After elevated to IAS, he became Commissioner of Madurai City Corporation . He served as Collector and District Magistrate, Krishnagiri. Then he assumed charge as Collector and District Magistrate, Erode on 30/08/2018.